Based in Florence, Italy, Mestolando is a very cool site for anyone interested in Italian cooking. While most recipe sites have a few pictures and directions, here, each recipe is accompanied by a video showing you how to prepare the dish. The player has an interesting UI with the video options (link, RSS, email) embedded in the player itself. It looks like Brightcove is hosting the videos. Brightcove is a newcomer to the video sharing space that's looking to convince mainstream content owners to use them as a channel to distribute their Internet TV offerings. Recipes can be filtered by ingredient, or you can simply browse through them. 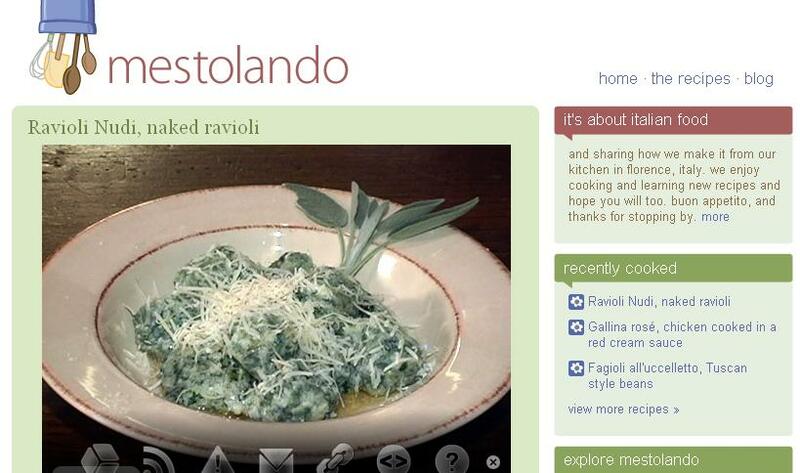 There aren't too many recipes online yet, but the site feels like a labor of love. Definitely recommended for any hapless cooks out there who need a hand with preparing dinner. If you have a date, it's a good way to wow him or her.